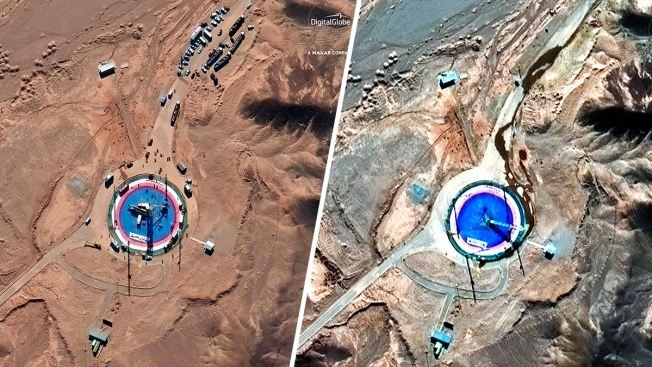 On Feb. 5, 2019, a satellite image (L) provided by DigitalGlobe shows a missile on a launch pad and activity at the Imam Khomeini Space Center in Iran's Semnan province. A different satellite image (R) from the next day, Feb. 6, 2019, shows an empty launch pad and a burn mark on it. Iran has said it would launch its Doosti, or "friendship," satellite. A launch in January failed to put another satellite, Payam or "message," into orbit after successfully launching it from the same space center.